Common Core in America today for most teachers is like the empty page of this blog’s background. With this state led initiative we, (teachers, administrators, principals, and our students), have embarked upon a journey where the end result is one that should put America on a competitive footing when compared to other countries quality of education. However, this journey we are all embarking on is constructed upon many facets of professional teaching practices that when first viewed looks to be very daunting for all concerned. As a third grade teacher in a inner city school who is starting to use common core for the first time, I know how frustrating the shift can be. Hello, my name is Winter and this is my first blog ever! I hope to convey both my excitement and my experiences as an inner city Elementary Private Catholic School Teacher with all the changes and challenges we are faced with along with giving some ideas to those who are struggling to see how to make the shift into Common Core. So lets get down to it shall we! Last month, I attended a Catapult Learning seminar focused on Common Core and while there I had the opportunity to communicate with other third grade teachers. I realized that the majority of the teachers did not have the concept of aligning the third grade curriculum to Common Core. The teachers were discussing that they also work in a inner city school and there is no money to get textbooks that align to the new Common Core curriculum nor is there very many teaching material that is align to Common Core because of the shortage in school dollars especially within the private sector. After working in the inner city schools I have learned that we need to be creative and open to new ideas. In addition, we also need to network with other teachers and share ideas and again I hope this blog become a way for us teachers to begin doing that. One idea that I would love to share with you today is how to implement graphic organizers during note taking that students can keep in their interactive notebooks. Last year I used Venn-Diagrams, KWL Charts, Mind Maps, Mind Dumps, Time Lines, Spider Webs, Bubble Maps, Think Abouts, Making Movies/Sequence Frames, Predict-a-Plot, On-Target Predictions, Story Maps, Story Building Blocks, Character Sketch, Setting,Events, and Character Actions, Clueing in to Context Clues, Problem Path, Writing a Picture, Cause and Effect, Puzzling, What’s the Message, and Vocabulary Word Map. The cool thing with graphic organizers is that you can be creative and adapt it to the needs of your students. 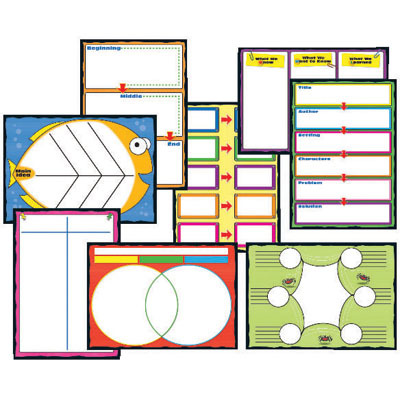 In addition, you can use graphic organizers across your curriculum. Oh, and don’t forget to have fun! The students can use different color pens and draw symbols or pictures that relate to the topic of study in their graphic organizers. I used Mind Dumps as an assessment at the middle of my unit, but you can also use them at the beginning of the unit. Mind Dumps will provide you what your students know or the information that they have retained from previous lessons. Mind Dumps allow students to write everything they know or have learned about a specific topic. The great thing about Mind Dumps is that students can also add new information or modify their thoughts. Mind Dumps help students to correct their misconceptions on the topic of study. I used Mind Dumps for all the subjects. The students would write the topic of study in the middle of the paper and around the topic they would write all the information they learned. Then they shared their ideas with a partner and if they liked their partner’s ideas they could record it on their paper.In addition, the students would write the learning target and the standard on top of the paper. The neat thing of having students do graphic organizers is that allow students to keep them in their interactive notebook and reference it during quizzes, homework, or classroom assignments. We are preparing our students to become independent lifelong learners. Keep reading for more ideas to implement in your classroom.